I get to cross yet another deck off my idea board today. Pauper is something I really don't have experience with (other than designing a Pauper Cube, but that's going to take a little while longer to work out the details), but this is a deck I've had my eye on for a while and wanted to design as my first Pauper deck. Since we're returning to Innistrad, I figured it might as well be time to show this deck off considering the primary mechanic, Soulbond, was in Avacyn Restored, the third set of the original Innistrad block. So let's go ahead and take a look! 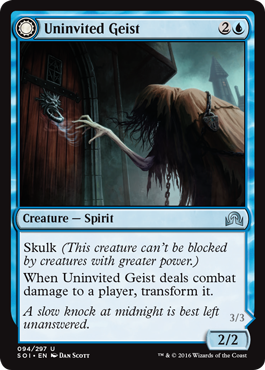 We're back with the second half of Shadows over Innistrad spoilers. 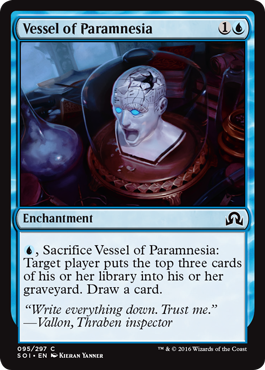 Just because it wasn't in last week's article or this week's article doesn't mean it wasn't good, bad, or creepy, just that I didn't have time to include every card in at least one category. Besides, mediocre is between good and bad, but isn't a category for our purposes. So let's begin! That's actually... really good. 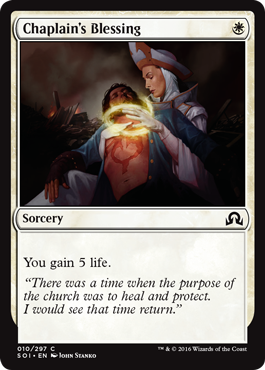 Sure it could be an instant and sure I guess you could cast it for zero mana or some other crazy thing some users on some forum I'm not mentioning could say, but yeah, five life for one white mana seems good. 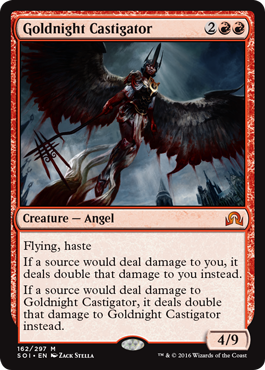 Good for control, good for lifegain decks, great in limited. Definitely good. 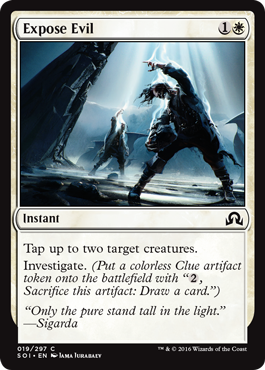 Control is going to love Investigate. Do things to people, then sacrifice tokens and draw cards to do more things to people. It's cheap and does things. Tokens. Two mana 2/2. Three creatures to flip it and when flipped it's a 4/4 minimum and then a 5/5 at end of turn if you didn't lose any creatures. A Secure the Wastes on turn four where X = 3, you basically flip this guy next turn, or sooner depending on what you did turn one and turn three. Yes. 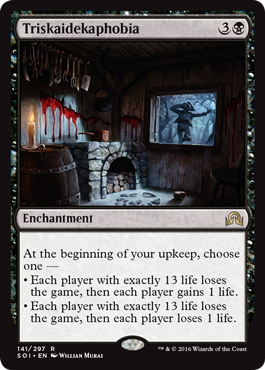 All we need is a Blood Artist in Eldritch Moon and some sacrifice outlet and we're in business... Or just do some crazy things with Eldrazi and Natuko Husk or something. 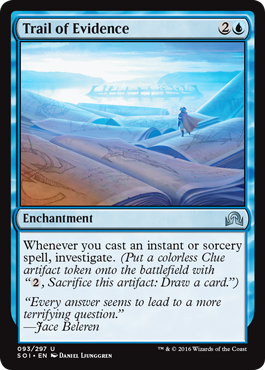 It's good because it allows for control to have a way to continue drawing cards and finding answers. I'm seeing a lot for control decks... Perhaps my view of favorite Magic decks is changing from aggro or some type of shenanigans to some kind of control deck. I love combat tricks like this. Perfect for a life gain deck and seems well worth the cost. 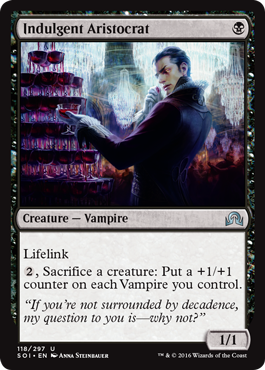 Great for Vampire Aggro decks that I foresee as being either strong in bigger tournaments or at least the kind of deck you'd see at a local FNM. Seems good. A four mana angel that happens to be a 4/9. With aggro, there may be downsides, especially in taking double damage, but any blockers to her should hopefully keep her alive. 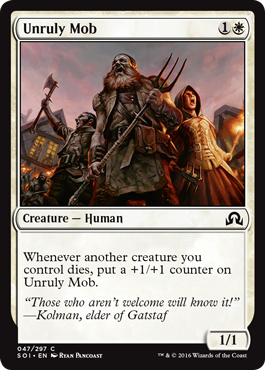 One mana to enchant a 1/1 creature that will likely die and allow for you to have a 3/4 basically with haste on turn three. I like it! Fun mana acceleration. 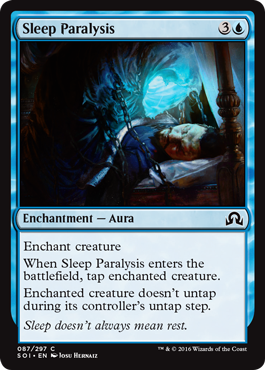 Given the lack of mana dorks for one mana these days, two mana to make all your creatures tap for mana is great. 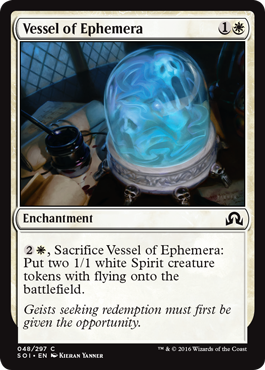 Think about it like this: Eldrazi Scions don't have to be sacrificed for mana and they now make colors. 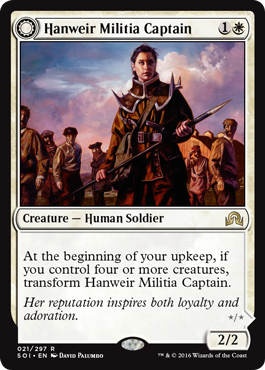 It's a really cool commander. 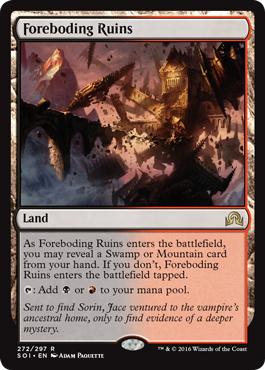 Drop in Azusa, Crucible of Worlds, and City of Traitors, and Ghost Town, and seems like a good mix. 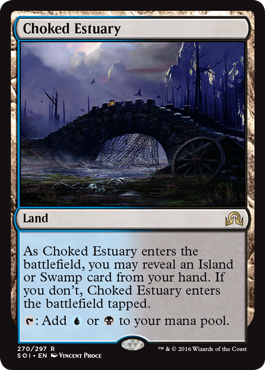 I don't see how useful this will be in Standard, but Commander is a different ballpark. I like this. Put it on any flip creature and flip the creature. It's a cool +3/+3 and first strike instead of +1/+1. 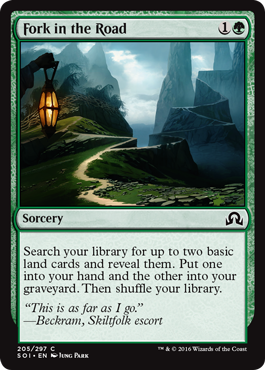 A dual land that comes in untapped when you reveal a land with basic land types. It's good early, not so good late game. 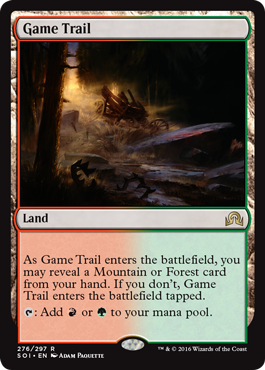 Of course the tango lands from Battle for Zendikar are better late game. Seems good. 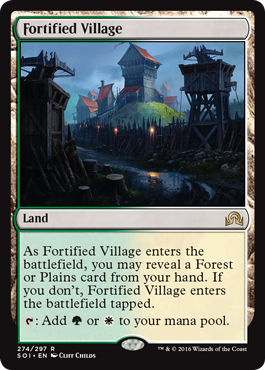 Plus it's always fun to see new lands. 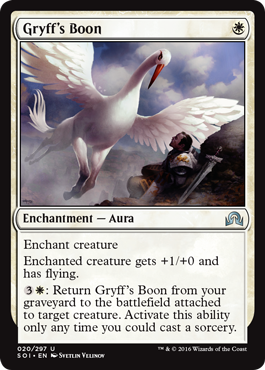 It looks good Flying, +1/+0 and costs only one mana, but returning it to the battlefield... It seems like wasted space in a deck. 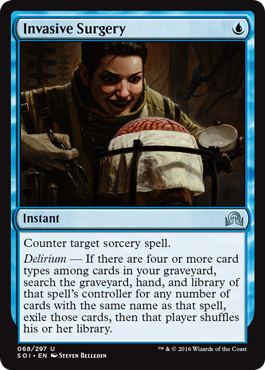 Sure it adds cards to your graveyard for Delirium, but for just tapping a creature? Not good. 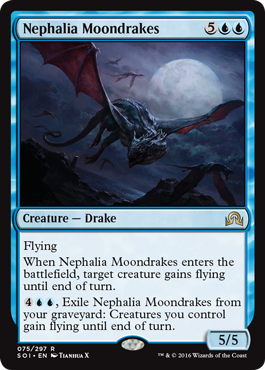 Five mana for two 1/1 tokens with flying. 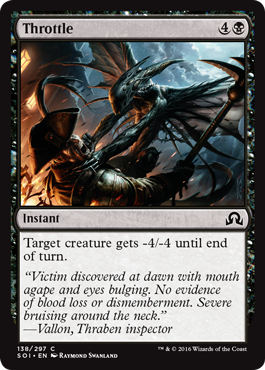 Compared to the previous Innistrad block, absolutely terrible. 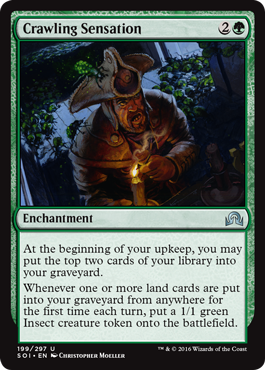 The high mana cost for small reward... it's what you want for a card in limited, but it's bad for everything else. 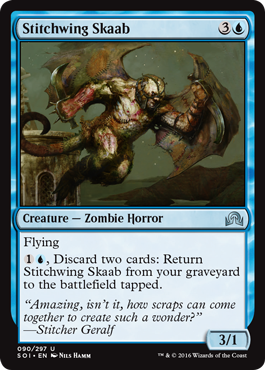 The mana cost is bad for a flying 3/1 and paying mana and discarding two cards to get it from your graveyard back to the battlefield seems worse. No point really. Three mana to mill three and draw a card. 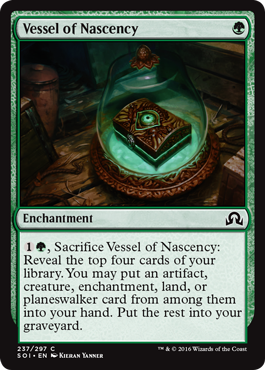 It seems all the Vessels just rehash cards from the original Innistrad block. Empire Strikes Back is typically what everyone says is the only good sequel, and if this cycle is a sequel to the original cards from a few years ago, I tend to agree. Basically you discard nothing and then get three free cards. At the cost of seven mana. 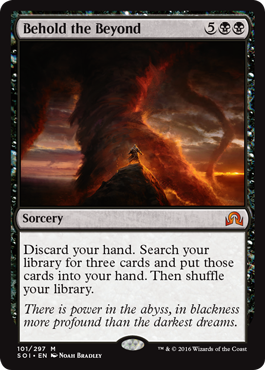 If it costs seven to draw three cards in black, I had better be discarding everyone else's hand too. Perhaps it's a bias, but it seems pretty worthless. When I first technically started playing, I liked this. 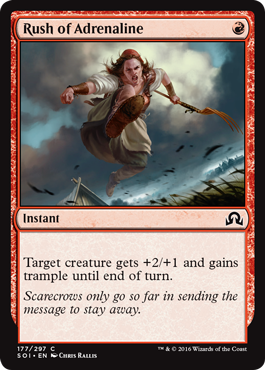 Everyone else said not to include this in the black/red aggro deck, and that's because it is bad. 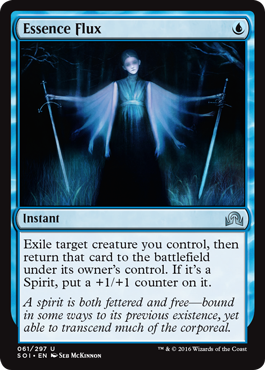 One mana to deal two damage to a creature in black, but it's an enchantment. 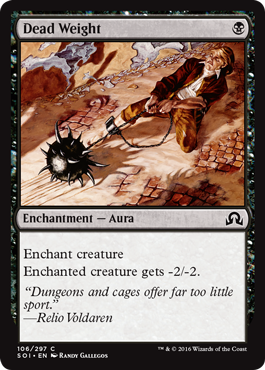 So unless you're killing creatures, which there are much better spells for, this serves no purpose. 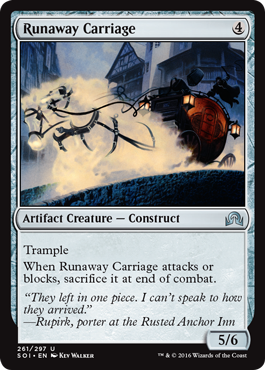 You cast it and the creature you enchant dies one way or another. Many better cards to include in your 40, 60, or 100. 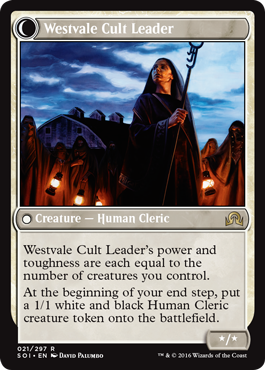 Or 200, but this isn't Legacy and we wouldn't want this in a Battle of Wits deck anyway. 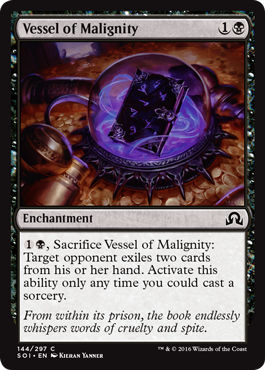 It's a similar principle to some of the above cards. 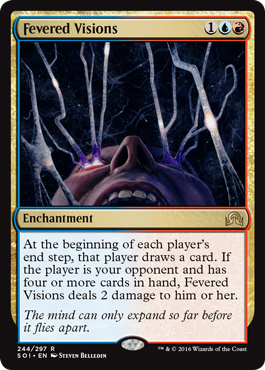 Sure a one mana 1/2 is good, but outside limited, it serves no point. 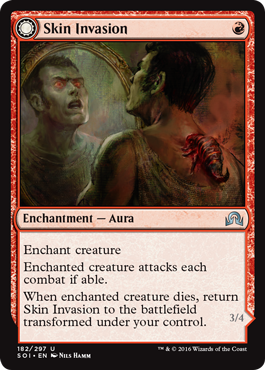 Why would you pay four mana to get a 1/2 out of your graveyard and back onto the battlefield? Unless you milled yourself and have no better options, but why go that method to begin with? Too little, too late anyone? I think at this point all the vessels are going to land on this list, just warning you now. One was on the list last week but the other four are here this week. I feel like I no longer have to explain why these are bad... 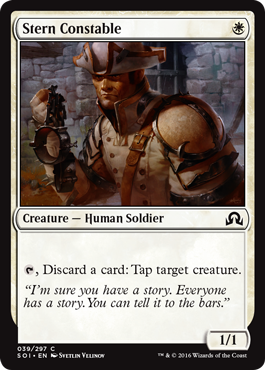 I mean, MAYBE this one sees play in control in Standard as a one of. Where else will this ever be useful? Okay... I feel the need to point these out together. 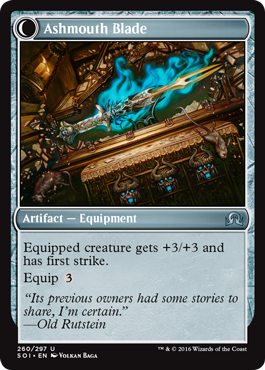 First of all, with the knowledge that Lightning Bolt was in M11 (five years ago) and that several "Shock" effects have been in since as well as three damage for two mana, anything that costs five or six mana to deal five damage is outrageous. Lightning Axe is cute in that you can discard a card and pay just one mana to deal five damage, and I get that, but just leave it that way. Don't throw in the alternative. Suggesting a total cost of six makes it less cool, less unique. 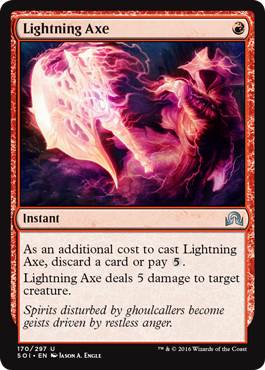 I'd prefer if all it said was "As an additional cost to cast Lightning Axe, discard a card. Lightning Axe deals 5 damage to target creature." Not that's sweet. I'd like that. 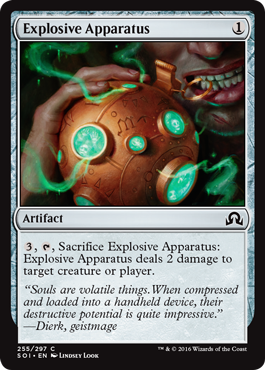 Five extra mana as an alternative cheapens the deal, ESPECIALLY when Reduce to Ashes does the same thing but better for one less mana. 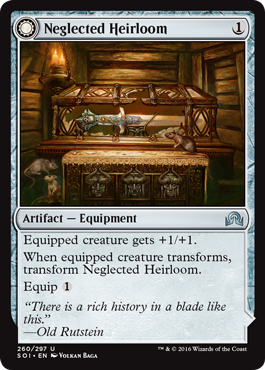 It exiles the creature so you can't return it to your hand from the graveyard. 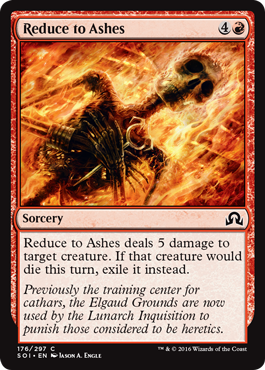 Not to mention Reduce to Ashes is a common and not an uncommon like Lightning Axe. I'm beginning to feel old. And get that irrational anger about things elderly people get. Check back with me next year and see how much more bitter I've become. Three mana and two lands gives you a 1/1 token and not even a good 1/1. 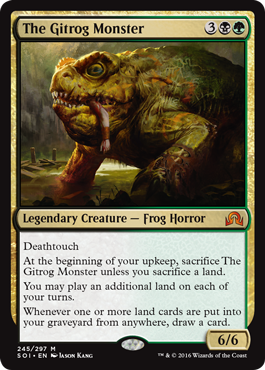 Unless this is for that Commander deck I talked about with The Gitrog Monster... No, I still don't see this being good. 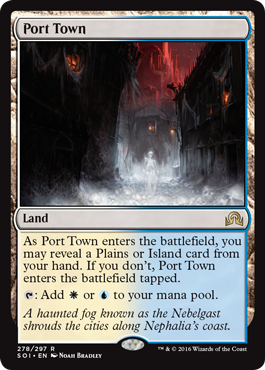 Even in that, you'd have to Ghost Quarter a land to get this then do it all over again each turn for a 1/1 token. 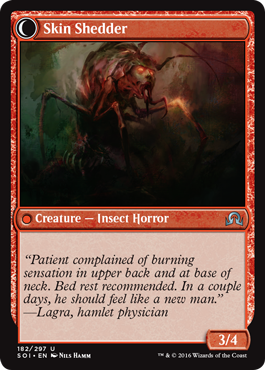 If it was better, or it was an Insect with deathtouch maybe, but there are so many better cards out there. A Springleaf Drum in creature form. Yeah... no thanks. Three mana to look at four cards, maybe get to pick one to keep, then ditch the rest. It's the best of the cycle, but still bad over all. Four mana to deal two damage. Again, it's like the Vessels... 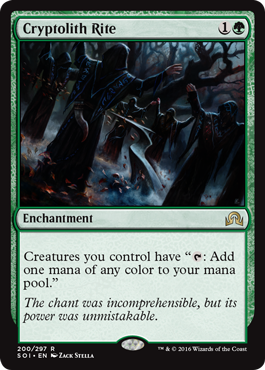 Honestly, I don't care for half the commons, but I'll admit to using them in a draft, sealed, or Magic Duels for lack of better options. I'm not sure if that's Sorin. I don't think so, but I've always thought those things were kinda creepy/weird. And why people like to pose in them at theme parks and/or Jamestown, VA/Plymouth, MA is beyond me... Just always seemed creepy to me. And this one looks kinda pointy. I don't think she's gonna make it. First, love the flavor, love the card. Art is a bit creepy. You know those paintings that look like their eyes are following you? The very idea of a giant toad that eats people is kinda... What's that word? Oh yeah... Creepy. Well, thanks for joining me on this adventure through good cards, bad cards, and cards that either have creepy art or creepy ideas behind them. Have a wonderful night!